UNIVERSIDAD PEDAGÓGICA Y TECNOLÓGICA DE COLOMBIA. FACULTAD DE CIENCIAS DE LA EDUCACIÓN. LIC. EDUCACIÓN FÍSICA RECREACIÓN Y DEPORTE. 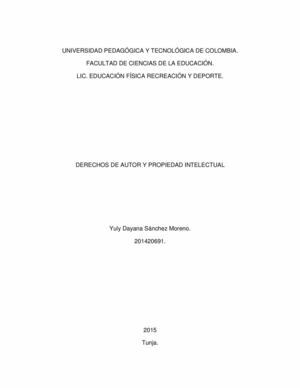 DERECHOS DE AUTOR Y PROPIEDAD INTELECTUAL Yuly Dayana Sánchez Moreno. 201420691. 2015 Tunja.